Drosophila have two basic forms of chromosomes—mitotic and polytene— that have vastly different morphologies and cellular roles. Polytene chromosomes are found in interphase nuclei of differentiated cells, being especially prominent in certain tissues of the larva and adult ovary. They are produced by repeated rounds of chromosome replication unhitched from nuclear division in a process termed "endoreplication." Among the largest and most familiar of polytene chromosomes are those of the larval salivary gland, which can consist of >2000 sister chromatids tightly aligned in register. Such scaled-up chromosomes permit production of large quantities of gene products in a narrow developmental window. The highly compact mitotic chromosomes, found in proliferating tissues (e.g., the larval central nervous system [CNS], imaginal discs, ovaries, and testes), are genome-packaging vehicles that, in association with the spindle apparatus, function to transmit complete copies of the genome between mother and daughter nuclei. Meiotic chromosomes also can be categorized as mitotic chromosomes, and some of their unique properties are touched on in Chapters 2-5 (for recent reviews, see refs. 1-3). (see Chapters 2-5, 17, and 18), including cytological studies of heterochroma-tin (see Subheading 3. and Chapters 16, 18, and 19). 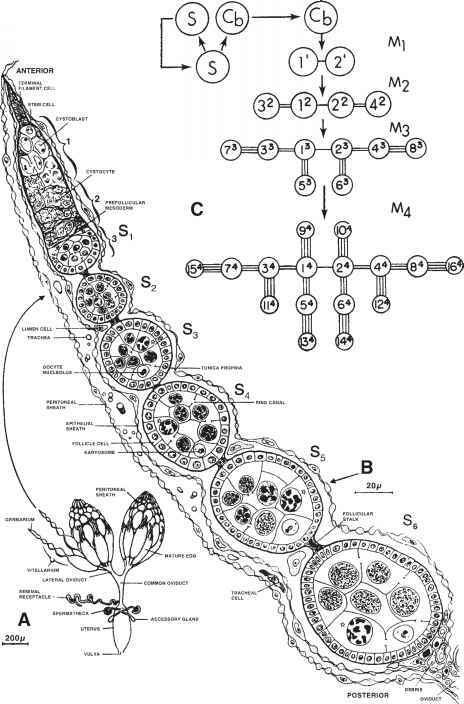 This chapter provides an introduction to the chromosomes of D. melanogaster, in both their mitotic and polytene forms. It begins with an outline of some of the pioneering work in the field of Drosophila cytogenetics, focusing mainly on achievements from the first half of the 20th century. More recent discoveries, flowing from advances in molecular biology, microscopy, probe technology, and electronic imaging, are referred to later in the chapter and throughout this volume.